The patients always wonder how Easy Vasectomy® is performed without a scalpel. The refined no-scalpel techniques of Easy Vasectomy® that minimize trauma, pain and complications. The introduction of no-scalpel vasectomy has successfully allayed many men’s fears with regard to the scalpel. 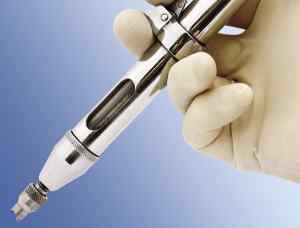 Conventional needle anesthesia in vasectomy involves the use of a 27 gauge needle to raise a wheal at the skin of scrotum; it is then advanced its full length along the vas on each side where further anesthetic solution is deposited. Dr. Shu uses the modern no-scalpel technique, exposing each vas in turn through a tiny opening in the front scrotal wall under local anesthesia. Since the opening is so small, it is easy to apply anesthesia without the use of needles. 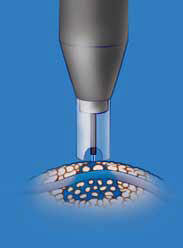 A spray applicator (MadaJet®) delivers a stream of anesthetic so fine that it penetrates the skin and diffuses to a depth of about 3/16 of an inch, enough to surround and anesthetize each vas tube in turn as it is lifted into position beneath the skin, attaining a close to 100% efficacy rate with no need for supplemental anesthetic. The tiny opening in the skin of middle scrotum is made with a pointy hemostat: one tip makes a pinpoint opening, then the two tips are used to spread and enlarge the opening to about 1/4 of an inch. Since blood vessels in the skin are spread apart rather than cut, bleeding is less than when a scalpel is used, no stitches are required, and the opening is usually sealed closed (often barely visible) by the next day. Once each vas tube is lifted through the small skin opening, it is divided under direct vision with fine pointy hemostat. Nothing is removed; the ends of the divided vas are placed out of alignment and kept from rejoining by applying a tiny clip to the sheath surrounding the vas so that one end stays inside the sheath, the other outside. The lining of the tube on upper end is destroyed with cautery (scarring it), the lower end is open without cauterization. While extremely effective (failure rate less than 1 in 2000), the technique provides for easier reversal (less scarring than when sutures are used) in men who choose reversal later in life. Procedure time is about 10 minutes. Most men say it hurts less than having a blood sample drawn. Many have called it painless. With the patient lying down, the scrotum skin is cleaned with alcohol and a small amount of local anesthesia is placed into the scrotal skin with a needleless pressure spray applicator or a fine needle around the vas deferens. Then the scrotum and its surrounding areas are prepped with Betadine. Dr. Shu begins the procedure on the right side by gently bringing the vas deferens to a position just under the scrotal skin. A tiny puncture is made with a pointy hemostat in the numbed area of scrotal skin. The vas deferens are then secured and pulled out with a ring clamp through the small opening. The surrounding fascia is stripped with a sharp instrument to expose the vas deferens.